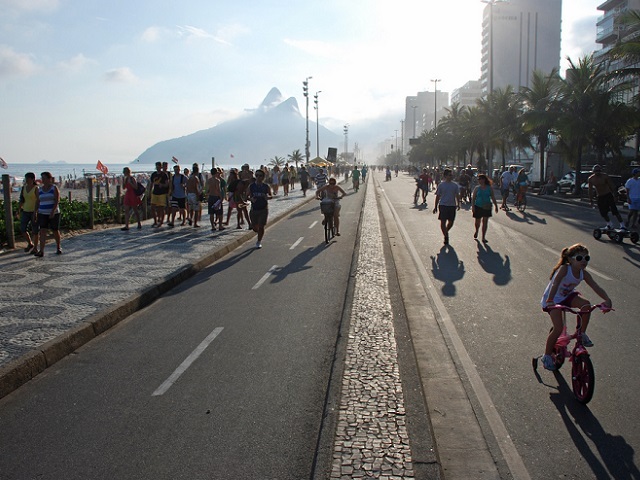 Brazil’s rising traffic fatalities show the need for traffic calming measures on roadways, and infrastructure that promotes pedestrian safety and well-being. Photo by Gerden van Heijningen/Flickr. Traffic safety improvements in Europe are being hailed as one of the greatest advances for the region in the past decade. Europe should be proud of its success: since 2010, there have been 17% fewer deaths on the continent’s roads. This translates into 9,000 lives saved. The European Union (EU) is on the cusp of meeting the goal set forth in the Decade of Action for Road Safety, which is to cut the number of road fatalities in half by 2020. This decrease is no fluke, either. According to official data, Europe saw 8% fewer deaths between 2012 and 2013 and 9% fewer deaths between 2011 and 2012. Yet, in this same period, Brazil saw a 4% increase in lost lives from 2011 to 2012, an increasing trend all too prevalent in Latin America as a whole. The disparity between traffic fatality trends in the two regions shows an uneven distribution of the impact of the global traffic safety crisis; however, it also shows emerging economies that this is not an insurmountable challenge. With a people-oriented approach to transport and dedication to enacting smart policies, this tide of fatalities can be reversed. An approach to creating transport infrastructure that puts people first is the first step towards stemming traffic deaths. The European Union developed a holistic, strategic plan for road safety. Among the plan’s measures were improvements to the street design that prioritized pedestrian safety, technology to help enforce traffic regulations, and driver education to be aware and cautious around pedestrians. Siim Kallas, Vice President of the European Commission and an active player in past road safety legislation, stated that he is committed to continuing this model of road safety throughout the decade. This combination of design, policy, and education makes Europe’s safety plan a model for the rest of the world, albeit, an imperfect model. Seventy people still die every day on Europe’s roads. Also, there is still a disparity amongst the different countries in the European Union. The United Kingdom, Sweden, the Netherlands, and Denmark reported 30 deaths per million inhabitants, while Poland, Bulgaria, Croatia, Latvia, Lithuania, and Greece saw over 80 lives lost per million inhabitants during the same time period. Each country can work towards improving traffic safety until the death toll amounts to zero. Over ten years, 41.7% more people died on Brazil’s roads than Europe’s. Even in Romania, where 92 people are killed in traffic per million inhabitants, Brazil exceeds this death toll by 150%, or 22.5 deaths per 100,000 inhabitants. The states with the largest increase in deaths are Maranhão (156%), Piauí (126.2%) and Bahia (105.7%). Innovative and swift legislation is needed, and the Ministry of Cities and Health has answered. The Ministry created the National Pact for the Reduction of Traffic Accidents – A Covenant for Life , which mandates engagement of the executive, legislative and judicial powers, as well as civil society, to reduce traffic accidents. Through the National Pact it has also prepared the National Plan to Reduce Accidents and Road Safety for the Decade 2011-2020, with recommendations based on five pillars: enforcement, education, health, infrastructure and vehicle safety. But whether cities take up this legislation and incorporate it into city plans is yet to play out. Currently, traffic accidents are a leading cause of death in developing countries. It is time for Brazil, and Latin America as a whole, to begin a different kind of leading, by combining smart policies and people-centered development plans to stem this increasing tide of road fatalities.